Council affiliated Clubs are located throughout New South Wales. These Clubs welcome enquiries for membership or information regarding heritage and historic vehicles, especially in their local areas. They organise regular driving tours, displays and community events. Each Club manages its own membership and facilitates Conditional Vehicle Registrations - either HVS with the RMS or CVS through CHMC. Below are cities and towns where CHMC clubs are located or located nearby. NOTE there may be more than one Council affiliated club in some locations. Is your CLUB interested in joining the CHMC? 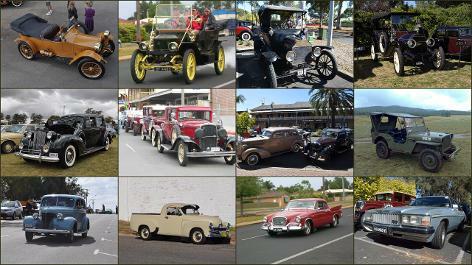 Membership enquiries are welcome from heritage and historic vehicle and machinery clubs in NSW whose goals include the preservation of vehicles more than 30 years old, whose objectives are compatible with those of the CHMC, and whose membership are owners of heritage or historic vehicles or road-going machinery. CHMC actively and very successfully represents heritage, historic and classic vehicle clubs to State and Commonwealth departments, other organisations and businesses in matters concerning the operation and preservation of Club member's vehicles. CHMC's negotiations with those deparments and groups reflect the majority view of it's member clubs on such matters as vehicle registration schemes, vehicle safety, fuels and automotive transport history and heritage. CHMC is well respected, credible and trusted by its membership, by government agencies, from the most senior staff to regional offices, and by other stakeholders in the heritage and historic vehicle sector across Australia. CHMC is an energetic and long-time member of the national peak body the Australian Historic Motoring Federation. If your club is interested in CHMC membership contact the CHMC REGISTRAR for a membership information package.